The War on Beef – Are cows the culprits? There is an old fake-science idea doing the rounds again at the moment. This is that cows are culprits in the global warming narrative. The problem, however, is that the scary image of cows destroying the planet with their carbon emissions doesn’t fit with how the planet actually works. No cow alive today, nor any cow that has ever existed, nor any cow that will ever exist, can add single atom of carbon to the atmosphere that wasn’t already there in the first place. At one point of the carbon cycle, it is true that cows emit carbon dioxide (CO2) and methane (CH4) to the atmosphere, each of which contains one atom of carbon. This is a basic fact of biology – but what about some other basic facts to go with it? All life is carbon based and the primary source of this carbon is the CO2 in the global atmosphere. As recently as 18,000 years ago, at the height of the most recent major glaciation, CO2 dipped to its lowest level in recorded history at 180 ppm, low enough to stunt plant growth. This is only 30 ppm above a level that would result in the death of plants due to CO2 starvation. It is calculated that if the decline in CO2 levels were to continue at the same rate as it has over the past 140 million years, life on Earth would begin to die as soon as two million years from now and would slowly perish almost entirely as carbon continued to be lost to the deep ocean sediments. The combustion of fossil fuels for energy to power human civilization has reversed the downward trend in CO2 and promises to bring it back to levels that are likely to foster a considerable increase in the growth rate and biomass of plants, including food crops and trees. Human emissions of CO2 have restored a balance to the global carbon cycle, thereby ensuring the long-term continuation of life on Earth. This extremely positive aspect of human CO2 emissions must be weighed against the unproven hypothesis that human CO2 emissions will cause a catastrophic warming of the climate in coming years. The one-sided political treatment of CO2 as a pollutant that should be radically reduced must be corrected in light of the indisputable scientific evidence that it is essential to life on Earth. Dr. Patrick Moore is a Senior Fellow with the Energy, Ecology and Prosperity program at the Frontier Centre for Public Policy. He has been a leader in the international environmental field for over 40 years. Dr. Moore is a Co-Founder of Greenpeace and served for nine years as President of Greenpeace Canada and seven years as a Director of Greenpeace International. Following his time with Greenpeace, Dr. Moore joined the Forest Alliance of BC where he worked for ten years to develop the Principles of Sustainable Forestry, which have now been adopted by much of the industry. In 2013, he published Confessions of a Greenpeace Dropout – The Making of a Sensible Environmentalist, which documents his 15 years with Greenpeace and outlines his vision for a sustainable future. A new book has been produced on the coast of South Australia (1). It is essentially about coastal geomorphology and includes much that I shall not mention here such as tectonics, coastal processes, coastal management and human impacts on coasts. This brief note presents, mainly in their own words, what they have to say about aspects of carbonate production. The South Australian coast originated with the separation of Antarctica and Australia about 43 million years ago, but the continental margin is well to the south of the present coast. During higher sea levels of the Late Eocene (37 to 34 Ma), the coast stood several hundred kilometres landward of its present location. Yesterday morning, before the frost had left the grass, I was sitting quietly beside my fashionably-green wood-burning heater reading the latest explanation in “The Green Gospel” on why the Arctic ice had not yet melted. Suddenly Flora burst into the room like an Arctic Blizzard with a look on her face that said I was in big trouble. “Well tell him to torture that awful Dorper ram that butts me, not my darling Maria. Where are those animal cruelty people when I need them”? Every morning just before dawn our rooster crows and soon afterwards the sun comes up. We have observed no exceptions over three months – clear evidence of perfect correlation. 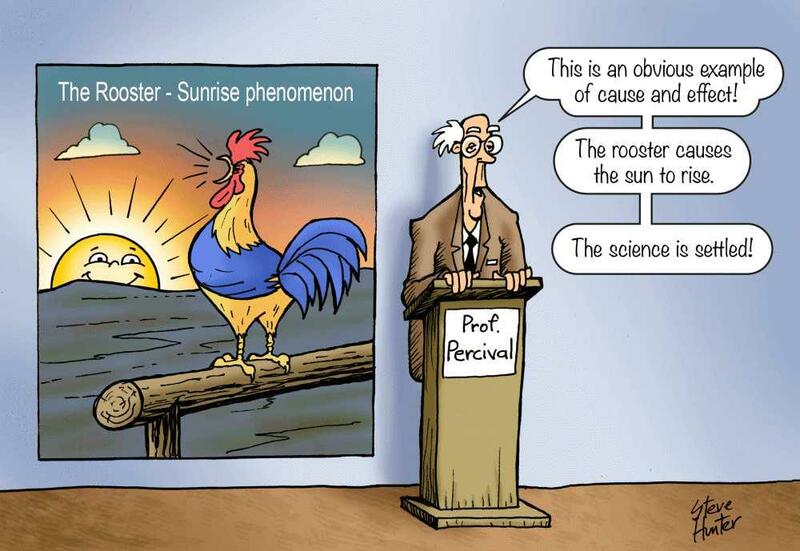 Therefore we have concluded that the crowing rooster causes the sun to rise. So I consulted Professor Percival, our neighbour. He is Professor Emeritus in the “Science in Society” Department at Top-Line University. He specialises in the effect of sound waves on atmospheric transmissivity. He says that some roosters produce sound waves of just the right frequency to affect the dawn visibility through the thick morning atmosphere. He has written pal-reviewed papers on the subject which has been named “The Percival Effect”. In all the hallowed halls, it is regarded as “settled science”. However, we decided that our rooster was not doing his day job, so he ended up as roast dinner last night. Flora was very concerned – “what if the sun does not appear at all tomorrow?” she wailed. But the sun rose as normal. Flora was relieved but a concerned Professor Percival went off to check his calculations “for feedback loops”. He is still checking. One thing was proved conclusively in just one day – the rooster’s crowing does not make the sun appear. Something else causes the sun to rise. Our ninety-two correlations did not prove causation. But just one disproof was needed to kill the Percival Effect. So it is with the Greenhouse Effect. For about 20 years now, carbon dioxide levels have risen steadily but global temperatures are trending level. Therefore CO2 does not control global temperature. One disproof is all that is needed. Every atom of carbon emitted by grazing animals was taken from the pasture that animal consumed. Which was taken from the atmosphere. Therefore all grazing animals are carbon neutral. Vincent Gray is a Wellington scientist with a long career in research who has specialised in climate science for over 20 years. 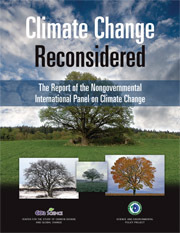 He has submitted comments on all of the Reports of the Intergovernmental Panel on Climate Change, 1,898 for the last one. He has published critiques on many of the issues involved and has concluded that carbon dioxide has a beneficial effect on the climate and not a harmful one. All plants depend on carbon dioxide, which is also the source of much of that other life-supporting gas, oxygen. There is no correlation between variations in carbon dioxide in the atmosphere and surface temperature. The increase of carbon dioxide in the atmosphere is wholly beneficial. There is no evidence it causes harm. Carbon is the essential building block for all living things. But life cannot exist without energy. The primary energy of the solar system is nuclear energy – it powers the sun which floods the Earth with solar radiation; other nuclear reactions release heat deep within the planet. But solar energy alone cannot create or sustain life. Earth’s primeval atmosphere had three natural gases that contained the essential ingredients for the first plant life – carbon dioxide, the food for plants; water, the drink for plants; and ammonia, which probably supported the first primitive life forms. It also had methane, the first natural (non-fossil) hydro-carbon fuel. Ancient atmospheres had far more methane and carbon dioxide than is present today (but no runaway global warming). Life emerged in water when primitive plants using solar energy and the magic of photosynthesis took carbon dioxide from the atmosphere to create sugars, fats and proteins in their leaves, stems, roots, seeds and fruits. Their exhaust product was another natural gas – oxygen. Millions of years passed, and slowly the plants consumed carbon dioxide and added oxygen to the atmosphere. Primitive animals then evolved; they used oxygen to extract carbon energy stored in plants. They consumed these carbon fuels and exhausted carbon dioxide. Life is truly a carbon equation. Carbon fuels such as wood, biomass, coal and oil are essentially preserved organic materials that store solar energy. When burnt in air they release stored energy and exhaust the same valuable by-product – carbon dioxide. The human race depends totally on carbon based foods that are derived from the gas of life, carbon dioxide, plus nitrogen, minerals and water. And since the invention of engines, humans have come to depend on reliable, efficient, energy-dense, portable carbon fuels to grow, harvest, transport, refrigerate, process, distribute and cook food. The exhaust product from all of these engines is an important stimulant to the growth of all plants. Without carbon dioxide, no life would exist. And without carbon fuels, modern cities would starve within weeks. A tax on carbon is thus a tax on life. A few weeks ago, perhaps as a prologue to the “global warming disaster” convention in Doha, Qatar, South Africa’s Department of Environment Affairs took out a full-page advertisement in our country’s newspapers, promoting National Marine Week. The ad showed a map of the Antarctic continent, from above the pole, surrounded by the vast blue Southern Ocean. It also promoted South Africa’s new Antarctic research vessel, SA Agulhas II. The advertisement’s text mentioned the massive Antarctic Circumpolar Current, which is responsible for distributing vital nutrients to the world’s oceans. It noted that the truly massive quantities of phytoplankton found in the ocean are vital marine building blocks in ocean processes. All that is true, and I certainly applaud efforts to protect the environment and promote National Marine Week and our country’s research efforts. But then, sadly, the ad’s discussion of physics content went off the rails. Referring to phytoplankton, it said “these microscopic creatures also use carbon to create energy.” Wrong! Carbon dioxide is a harmless, colourless, non-toxic, natural gas that is the key link in the carbon cycle of life. To call it “pollution” and turn the world upside down in a futile attempt to affect the climate, while ignoring REAL pollution, is an obscenity. Have a look here at real pollution.